On Wednesday, June 7, the U.S. Mint will release one of its most popular annual products for collectors, the 2017 Silver Proof Set. Five 2017-S ATB Quarters with the one-year designs celebrating Effigy Mounds National Monument (Iowa), Frederick Douglass National Historic Site (D.C.), Ozark National Scenic Riverways (Missouri), Ellis Island (New Jersey), and George Rogers Clark National Historical Park (Indiana). All but three of them are in 90% silver and 10% copper. The quarters, half-dollar and dime are in silver while the dollar, nickel and penny are composed in regular clad like those found in circulation. The coins are separated into two protective lenses that ship inside a simple cardboard box and accompanied with a card that bears the U.S. Mint’s certificate of authenticity and readout of specifications for every coin. The silver coins of the set have a combined silver weight of 1.34 troy ounces. Based on Monday’s London silver price of $17.52 an ounce, each set has a silver melt value of $22.45. In contrast, the legal tender face value of the 10 coins totals $2.91. The set itself is priced at $47.95. 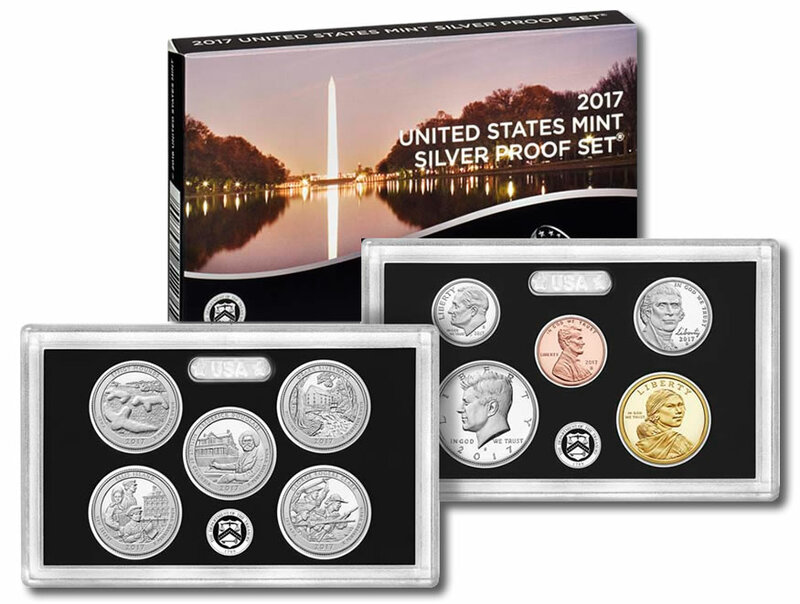 When released at noon ET on the 7th, order the 2017 Silver Proof Set directly from the United States Mint’s website, found here, or call using 1-800-USA-MINT (872-6468). No mintage, household or order limits are in place and several hundred thousand will sell. Last year’s set recently sold out with last reported sales of 369,874.